Kicking off the final part of show area coverage of the 2011 Japfest show, I thought I'd try and appease our wheel loving friends with this amazing set of titanium lipped Gram Lights. The Rare Rims stand featured this Chargespeed kitted S2000 on Rota Torques. 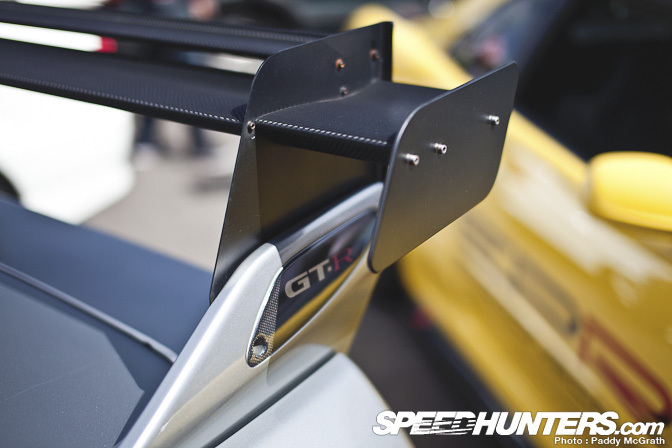 … along with some extensive aero. Built in the United Kingdom, powered by Honda. Who doesn't want to experience one of these first hand ? A rear view of this S2000 on SSRs from the first post. I really liked how simple and subtle this car is. '86 Levin on the JDM Garage stand. 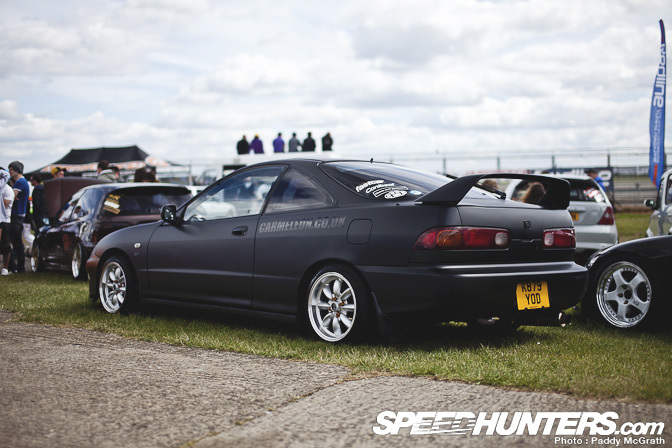 Matte black DC2 Integra on the Fast Car stand. Definitely an unusual styling scheme developing here. Back in the drift paddock, Ben Broke Smith had arrived in his blisteringly fast JZX81 Chaser. Check the car out in action in Ross's upcoming Drift Allstars report. The Driftworks S15 suffered terminal engine failure during the morning sessions with a suspected big end bearings / crank failure. I'm sure it'll be back out in no time ! James 'Buller' Bull's PS13 was looking tidy on the Driftworks stand. Gary Hughes is another of the UK contingent representing the ER34 Skyline. 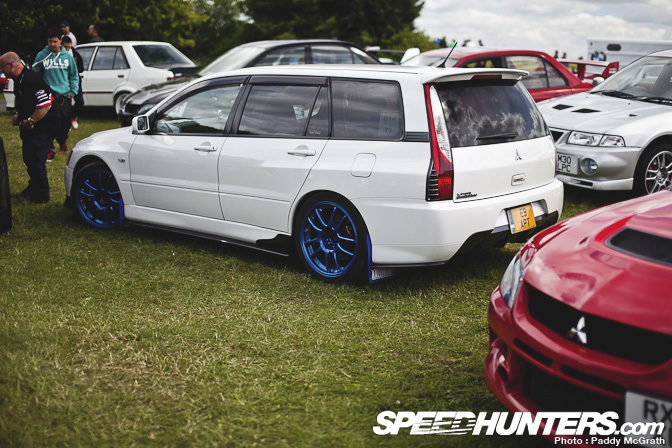 Lancer Evolution IX wagon. Wow. 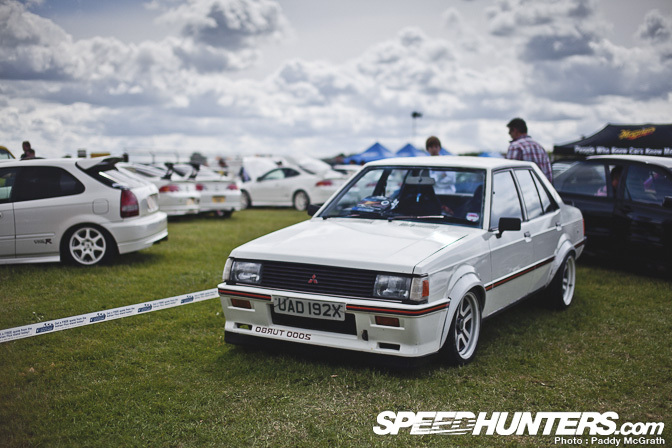 This Lancer 2000 Turbo on the MLR stand stood out against the sea of newer generation Lancer Evolutions. I was pretty impressed by this little Micra dropped on Snowflake style wheels. 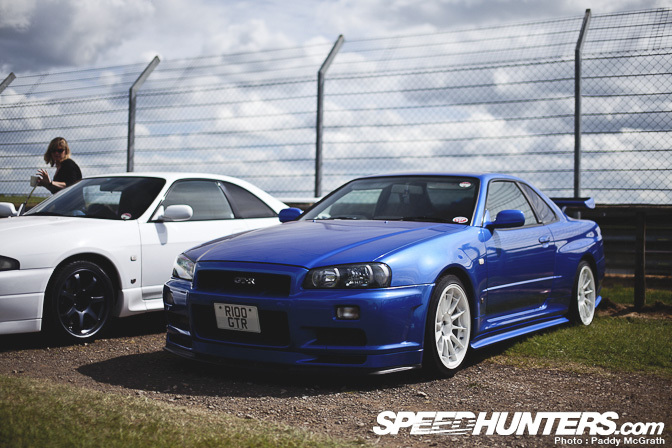 I do love me a bayside blue R34 GT-R. 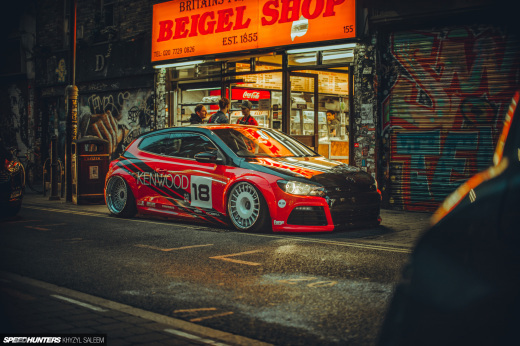 This example on Enkei wheels was no exception ! 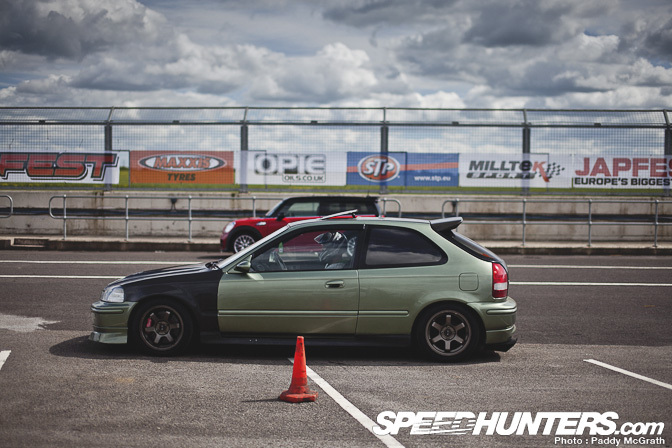 A clean EK Civic gets ready for some track time. 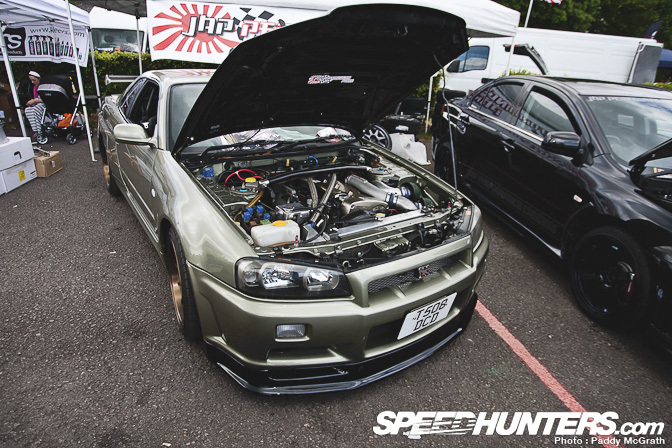 This Work XD9 wearing R34 GT-R drew a lot of attention on the Jap Performance Parts stand. DC5 Type R for sir ? BBS LM wearing R35 GT-R on the Forge Motorsport stand. More BBS LM love, this time on a tidy S15 Silvia. The Z cars were well represented in the club stand area, I even found a certain 1JZ powered car that Ross discovered at the BHP show. Spotlight later in the week on that. I was reading Jordan Butters' coverage on the Slammed Society blog on Fatlace and he mentioned that there are far more R35 GT-Rs on the road now in the UK than R34 GT-Rs. Although I do enjoy spotting the R35 in the wild, I do feel a little sad that the R34s are going to slowly start becoming a rarer sight. I was pleasantly surprised to find a couple of Stageas at the show, I particularly liked this Nismo graphiced version. 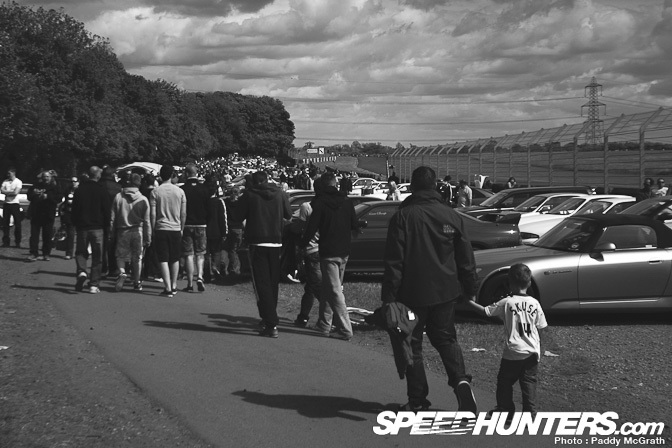 I've made no secret that show and shine and club stand area of the Japfest show was more than too much for one man to handle. 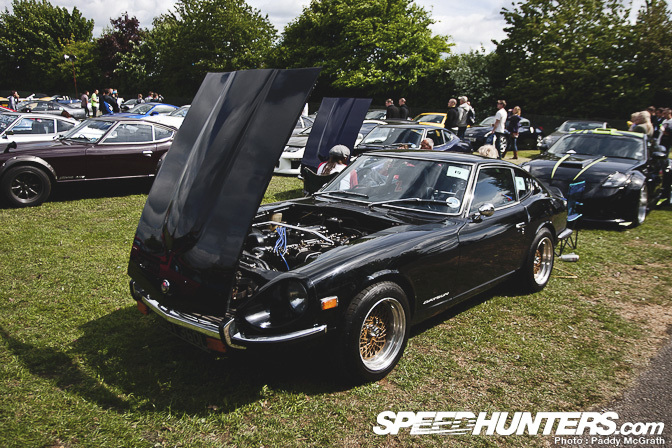 What I've shown to you over these last couple of stories is literally a taster of what Japfest offered. For the next part I'm going to take a look at the on-track action followed by a couple of spotlights ! So the Rare Rims S2k was rockin some Rota's huh...rare indeed. lol. Nics pics, but where is Part 2 if this is Part 3? wow, some classics hiding amongst all the modern stuff.. Lancer 2000 Turbo and that Black Datsun 'Z' chassis. plus i'd love a set of those titanium edged Gram Lights. thanks for the coverage. 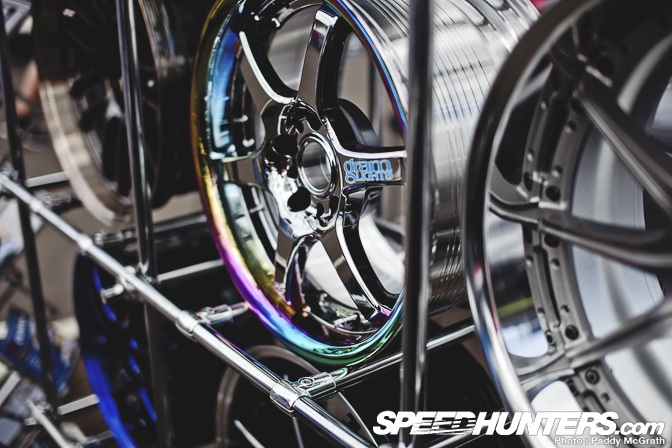 "The Rare Rims stand featured this Chargespeed kitted S2000 on Rota Torques." You do realize "Rare Rims" is the UK distributer for ROTA wheels only. OK that even makes me lol. 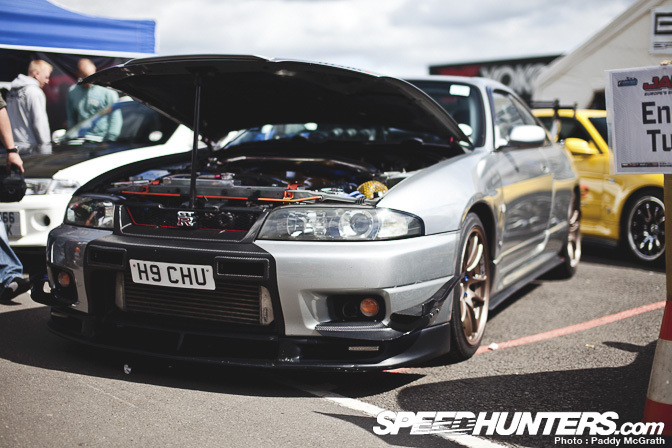 "I was reading Jordan Butters' coverage on the Slammed Society blog on Fatlace and he mentioned that there are far more R35 GT-Rs on the road now in the UK than R34 GT-Rs. Although I do enjoy spotting the R35 in the wild, I do feel a little sad that the R34s are going to slowly start becoming a rarer sight." Very true, here in London I see loads of R35s, yet I've never seen an R34 GT-R.
very impressive and equally interesting to see car culture in the UK diverging away from those twats in camelion paint saxos and 206s...good to see people have sense. cant wait to join people next year for this show hopefully. i barely ever see R34s, i must have seen about 10in my life...and in the past 3 years i have seen double that of GTR R35s, makes no sense....R34s are bargins!! Haha, "Rare Rims" + Rotas = fail. Still, looks like a fun event! That Lancer 2000 Turbo has the same wheels as my 87 Chrysler Conquest, Aka Mitsu Starion. Needs some SHP 8's in the front though. @DRFTmonkeh The word 'jap' is only considered a racial slur in the US, from what I've seen. It was brought around by the hate towards Japan after WWII. 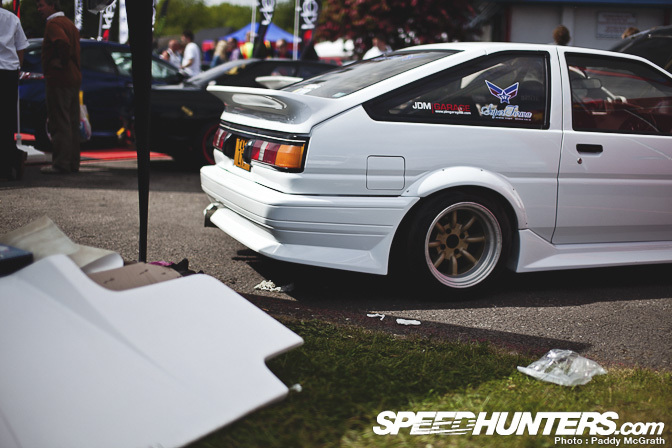 Here in Britain it has no such connotations, hence we have Japfest, Japshow, Japspeed etc. To us, it's just like calling a British person a Brit, a Scottish person a Scot and so on. Great article by the way Paddy! That olive green ek was a monster on the track. Almost keeping up with the touring cars! Cheers for the pic of the EK! To the comments about "Rare Rims", that's the name of the UK supplier for Rota wheels, so that's why the cars have Rotas. Company name FAIL (Rare Rims  Rota). "I believe those wheels on the Micra are ATS Cups. VW guys wheel"
@ DRFTmonkeh We had that discussion last year, let it lie, it's no win situation. Thats my Bayside Blue 34 Nice pics and great day out! Paddy!!!! Do a feature on that Nismo'd Stagea!!!! Nice Micra! BTW, the wheels on it are ATS Classics. 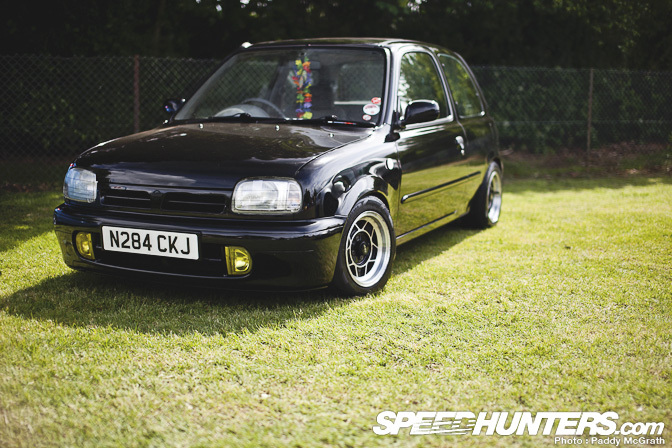 The wheels on the Micra are ATS Classics. nope, the rims are ATS Classic. 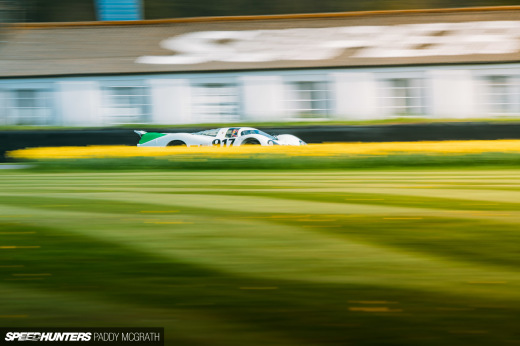 Thanks for the Z cars mention, but you may have missed the very rare G nose in the background! Looking forward to part 4 of the track coverage! Yes the olive green ek was fast on track. Did you get any pics of the DA integra on track? 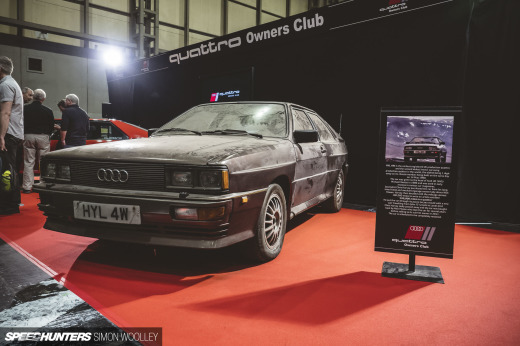 Regarding rare rims and rotas, I think they name came about as back in the day even rotas were 'rare rims' in the uk, and the guys set the company up after becoming the first uk rota distributor. Yes rotas are still popular especially on daily drives over here, but there is much love for the real deals too. Remember the uk is generally about 5 years behind the us in terms of styling trends. I daily'd my car for a couple years with a CE/TE combo and they never got nicked. I would recommend moving out of the ghetto if you're worried. I hate on Rotas because they don't show engineering or design intelligence. They're not designed, they're copied. Rims on Micra are ATS Classic 13x8 !!! Thats my Micra on the Classics Check out the Micra club to see more! are you shooting film here? lovin' that flat black teggy, truly is a breath of fresh air from all the cookiecutter jdm-look honda's. btw rarerims was about the only distributor in europe for replica's of rare rims back in the days, hence the name. almost nobody could get their hands on the original rare rims at that time. now you have a choice.